With our half day tour to Segovia you will discover one of the most impressive cities of Spain with a lot of history. During an hour and a half walking tour with our official local guide you will explore the most outstanding monuments of the city. You will find Roman heritage reflected in its majestic Aqueduct of almost 2000 years of antiquity or you will see the Alcázar, the medieval castle that has served as an inspiration for Walt Disney. You will have free time to enjoy the city, its culture and its richest gastronomy. Choose the best tour to Segovia and let be impressed by the beauty of this city recognized as a World Heritage Sites! We will star our tour from the centre of Madrid. Our comfortable tourist bus will pick you up at 9:45 in Plaza Emperador Carlos V, 8, (next to the Hotel Mediodía, nearest metro Atocha) and at 10:00 in Plaza de España, 7 (in front of "Apartments Plaza de España", nearest metro Plaza de España). You can easily reach these stops located in the centre of Madrid by public transport. Our official local guide will receive us in Segovia to begin an hour and a half walking tour. 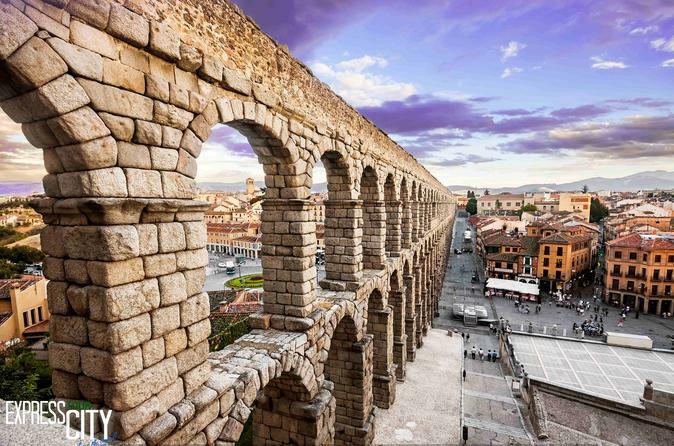 We will start our tour contemplating the impressive Aqueduct of Segovia, one of the best preserved Roman constructions in the world. We will continue walking through its charming streets that remind us of its medieval past, observing its beautiful Gothic cathedral, the whole of the Plaza Mayor, the Jewish quarter and of course another of its magnificent monuments: the Alcazar. This castle served as the residence of the Kings of Castile and it´s the essence of the city. After the guided tour you will receive an informative map with all the monumental treasures and you will have 3 hours of free time to continue enjoying the city. Get lost in the beautiful medieval streets of Segovia, see the interior of its magnificent monuments and enjoy the gastronomy of Segovia, one of the richest and the most appreciated in Spain. The tender grilled piglet, roast suckling pig or the bean stew are some examples of its exquisiteness. Finally, after a day full of emotions our tourist bus will pick you up at 4:00 p.m. close to the Aqueduct, Plaza del Azoguejo 1, to return to Madrid. Comfortable round trip in a touristic bus. Pickup points in the centre of Madrid. Guided tour around the most impressive monuments for an hour and a half. Children under 10 years old are free of charge (one per adult).